With the help of her cousin, Ray Anne Dysart, and her boss, Grace Dillon, Ginger Dysart has conquered the depression that almost destroyed her after the death of her infant son from SIDS. Ray Anne’s indefatigable optimism, Grace’s kindness, her job at Grace’s flower shop, and the supportive community that Thunder Point, Oregon, offers even to newcomers have helped Ginger restart her life. Although the loss of her child has left a hole in her heart that can never be filled and she still questions her sanity in falling for her former husband, a self-absorbed singer/songwriter unprepared for fatherhood, Ginger has found that it is still possible to find joy and purpose in life. Joy is certainly the mood of the day at the Lacoumette farm where the wedding reception of Peyton Lacoumette and Dr. Scott Grant takes place. Ginger helped Grace with the flower arrangements, but she skipped the wedding. However, the wonders of Basque food, music, and dancing and the warm welcome of Peyton’s large extended family make Ginger glad that she attended the reception. With a new dress and more invitations to dance that she can count, she is even feeling pretty for the first time in a long while. But the magic of the evening ends when a good-looking Basque refuses to accept her refusal to dance or pursue other, more interesting options. When he gropes her, Ginger is forced to give him a shove that leaves him on the floor, drunk and unconscious. Part-time professor and full-time farmer Matt Lacoumette knows that he was a jerk, but his sister’s wedding reception on the exact site of his own wedding two years earlier was just too much for him to handle sober. As a result, the asshat behavior that has become his modus operandi ruled the occasion. Less than a year after his wedding, Matt’s marriage was over, and he is still filled with bitterness over his ex-wife’s inability to adapt to life as the spouse of a farmer, still filled with mixed emotions about her, and still dealing with anger over the choices she made. His siblings may have christened him “Mad Matt” since his divorce, but Matt is sane enough to know that his drunken behavior was inexcusable. He owes apologies to his parents, his sister and brother-in-law, and to the woman he accosted. His memories of the episode with Ginger are dim, and Matt is pleasantly surprised by how attractive he finds her when he visits the Thunder Point flower shop to make his apology. He never intended to make an invitation to dinner part of his grovel scene, but he wants to see more of Ginger. Dinner is a success: “He made her laugh and he was mesmerized by her sweetness and charm.” An easy friendship develops between Ginger and Matt as they share bits of their lives and pieces of their hearts with one another through long, nightly phone calls and occasional dates. Ginger fits in beautifully with Matt’s family, comfortable with farm life and with the exuberant Lacoumettes. But when the relationship turns romantic, Matt’s doubts surface and he runs. Even when he realizes his error, complications from his marriage and divorce, heavier than even his family knows, shadow his relationship with Ginger. Matt must deal with his past and his residual anger before he can build a future with the woman who has totally claimed his heart. As is typical with Carr’s books, the central romance unfolds against a backdrop of community life that includes secondary plots and appearances by a score of characters, most of them familiar from earlier books. Fans of the series will be pleased that A New Hope allows them to attend the beach wedding of Grace Dillon and Troy Headly (One Wish). The book also shows couples from earlier books as they prepare to become parents, and Grace’s mother, Winnie Dillon, an ALS patient, as she prepares to spend the final stage of her life as part of the Thunder Point community and in a less fraught relationship with her daughter. A New Hope is the eighth Thunder Point book, a series which promises to be as long-lived and beloved as Carr’s trend-setting Virgin River series. 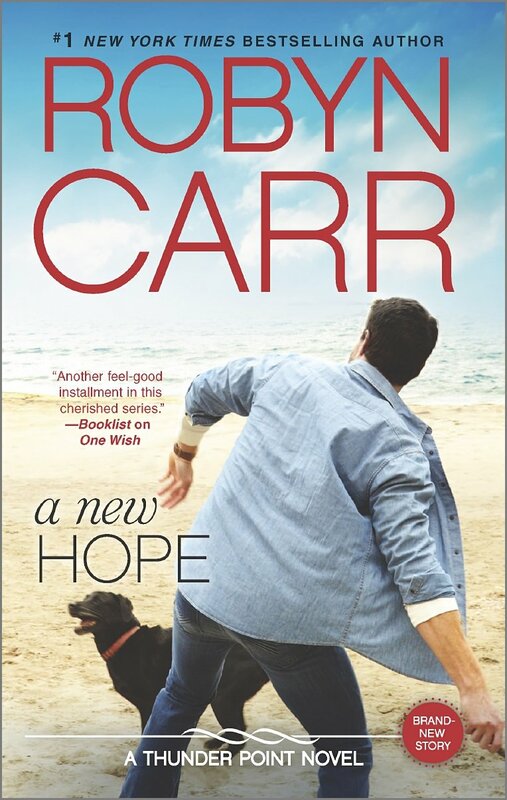 This book proves once again what a consistently good writer Carr is. She is particularly effective in creating communities peopled with characters whose lives realistically mirror ordinary life and who prevail over their problems with the support of family, friends, and community. Ginger and Matt are engaging additions to Carr’s cast of characters. 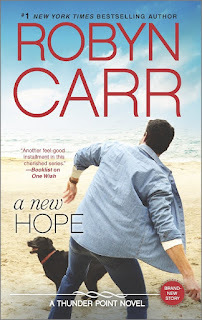 If you are a Carr fan, if you are a reader who can’t get enough of small-town romance, or if you search for stories in which the wounded are healed, the lonely find love, and lovers find a deserving and credible HEA, you should add A New Hope to your to-be-read shelf ASAP. This is already on my wishlist. Love Robyn's books. I've added this to my TBR. Her books never fail me. Great review. Fav genre is contemporary romance. Never been to D.C. furthest I ever traveled was to Calif to see my daughter. I enjoy Carr's books. Every time I get one, it is like going for a visit with friends. She has created another town I can't wait to visit. I look forward to visiting Thunder Point many more times, and any other town she wishes to introduce me to.